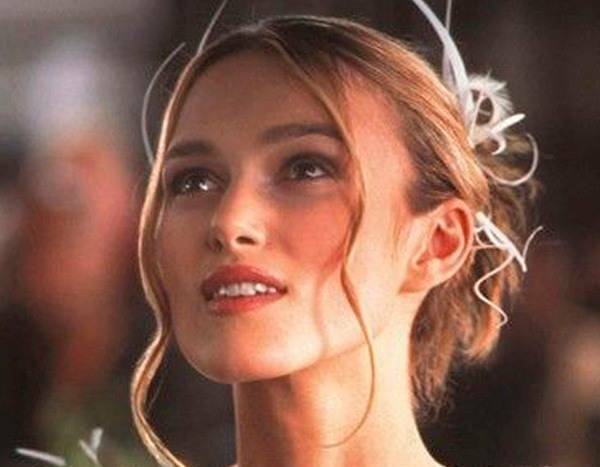 Hip, hip hooray, it’s Keira Knightley’s birthday! The British actress turns 34 years old and honestly, she only gets better with age. Throughout her career the brunette beauty has had a history of taking on period pieces and channeling characters of the past, royalty and romantic tales of yesteryear and we love her for them all. She’s made us fall in love in Pride and Prejudice, made our hearts hurt with her role in Love Actually and with her latest movie, The Aftermath, she has us rooting for star-crossed lovers from World War II. When Knightley isn’t giving us all the feels in her romance and time period movies, she is showing us that ladies can be fierce pirates too with all of her appearances in the Pirates of the Caribbean franchise. Elizabeth Swann, err, we mean Knightley, we’d sail to the ends of the earth searching for treasure and Davy Jones’ locker with you any day! Since it is the Oscar-nominated actress’ birthday it’s only fitting that we should pay tribute to her long, and very impressive, movie career. From all of the Pirates of the Caribbean films to her roles in Atonement, The Imitation Game and The Nutcracker and the Four Realms, Knightley has proved that she can do it all when it comes to her film career. She is a true chameleon and we love all of her sassy, lovable and dynamic roles throughout past few decades and we wouldn’t know how to pick which one was the best of them all. That’s where you come in! We want you to vote on the birthday girl’s best film of all time below and then maybe binge watch her epic movie catalog all week to celebrate. In 2002, Keira Knightley came onto the screen in a major way with Bend It Like Beckham. The comedy is about two girls who both have families who don’t understand their love for football. Jess (Parminder Nagra) is the daughter of orthodox Sikh who only want their daughter to find love and be a wife, while Jules’ (Knightley) mom thinks she’s a lesbian based on the fact that she loves the sport. Both have talent and together they prove that girls can do it all. Knightley’s role as the governor’s daughter, Elizabeth Swann, really put her on the map and it all began with The Curse of the Black Pearl. In this Pirate’s of the Caribbean film, Elizabeth is taken by a group of undead pirates and only her blacksmith admirer Will Turner (Orlando Bloom) and a scrappy pirate name Captain Jack Sparrow (Johnny Depp) can get her back. Love Actually is an iconic holiday film that takes place the month before Christmas in London, England and Knightley is just one of the many love stories told throughout the film. She plays Juliet who gets married, but later discovers that her husband’s best friend, who she thought hated her, was actually in love with her in one of the most memorable scenes in the movie…involving giant cue cards. When Knightley was only 19 years old, she became a hero…at least on screen. In King Arthur, the actress portrayed Guinevere, an arrow-wielding warrior, who is also a part of one of the most iconic love triangles ever between Arthur and Lancelot. This tale is unlike the myths we all know, because it is based on the archaeological roots of the real King Arthur and his knights. Jane Austen’s iconic story comes to life thanks to Knightley and Matthew Macfadyen as Mr. Darcy. In this film, Elizabeth Bennet (Knightley) falls in love with Mr. Darcy, and he falls for her, despite the gap between their class levels and the fact that upon first meeting they can’t stand one another. The real question is will they be able to overcome their pride and own prejudices and live happily ever after? In 2006, Knightley reprised her role as Elizabeth, but this time she is a pirate like her love Will (Bloom). Together they help Jack Sparrow (Depp) recover the heart of Davy Jones in order to keep him from having to become a slave to Jones’ forever. In At World’s End, Captain Barbossa (Geoffrey Rush), Will (Bloom) and Elizabeth (Knightley) sail to the edge of the map to find Jack Sparrow (Depp) before fighting a massive battle to end all battles. After her young sister Briony (Saoirse Ronan) accuses her lover Robbie (James McAvoy) of a crime he did not commit, Cecilia’s (Knightley) world and the lives of those around her change forever. In 2008, the 34-year-old actress took on the role of Georgiana, Duchess of Devonshire in this biography/drama film, which shows the personal and political life of the 18th-century aristocrat. Knightley wowed in yet another period piece when she played Anna Karenina in this romantic drama taking place in the late 19th century in Russia. It follows the story of Anna, who is an aristocrat in St. Petersburg who has an affair with the handsome Count Alexei Vronsky (Aaron Taylor-Johnson). After moving to New York City with her boyfriend Dave (Adam Levine), Gretta (Knightley) must find her own way in the music world when Dave gets a major record deal and cheats on her. Luckily, a chance encounter comes her way while playing in the East Village when Dan (Mark Ruffalo), a washed-up label exec likes her talent and decides to collaborate with her. Megan (Knightley) is having a quarter-life crisis after her boyfriend proposes, so she escapes for a week to her new friend, a 16-year-old named Annika’s (Chloë Grace Moretz) house. While there she tries to figure out how to be an adult, not to run away from her problems and how to love…with Annika’s single dad. Based on the real life story of English mathematical genius Alan Turing (played by Benedict Cumberbatch), The Imitation Game reveals what happened when Alan and his team of code-breakers, one of which is a woman named Joan Clarke (Knightley), race against time in order to crack the German Enigma code and stop World War II from continuing. In 2017, the English actress reprised her role of Elizabeth for one last time as Captain Jack (Depp) searches for the trident of Poseidon with her son Henry Turner (Brenton Thwaites). Parisian writer Henry Gauthier-Villars (Dominic West), known as Willy, might be the toast of the town after his successful novel about a girl named Claudine hits the shelves, but it is his wife who wrote the tale and she’s not ready to stay silent about her ghostwriting forever. In fact, Colette (Knightley) and her semi-autobiographical novel’s cultural sensation status makes her seek out creative control of her novel, her fashion, her sexuality and her life and in the process challenge traditional gender roles. Clara (Mackenzie Foy) is transported to a magical world of four realms, the Land of Snowflakes, Land of Flowers, Land of Sweets and the ominous Fourth Realm that is being run by the tyrant Mother Ginger (Helen Mirren). She must team up with a soldier named Phillip (Jayden Fowora-Knight), a gang of mice and those who preside over the three good realms, including the Sugar Plum Fairy (Knightley) to save all of the kingdoms from getting taken over by Mother Ginger. Official Secrets is the true story of British whistle-blower Katharine Gun (Knightley) who leaked information to the press about an illegal NSA spy operation in order to try and push the UN Security Council to sanction the 2003 invasion of Iraq. When the war still happened, Katharine was arrested for breaching the Official Secrets Act, and her legal battle exposed high levels of the government. Berlin, I Love You is set in Berlin, Germany and tells 10 different stories of romance, one of which is Jane (Knightley), who takes in a child from the streets in hopes of changing her life. In 2019, Knightley’s latest film hit theaters. In The Aftermath, a British colonel and his wife Rachael (Knightley) are assigned to live in Hamburg, Germany after World War II. They are there to assist with post-war reconstruction, but things get complicated when tensions, grief, passion and betrayal unfold between Rachael and the home’s former owner, a German widower (Alexander Skarsgård), who still lives on the premises with his daughter.